Increasingly, IT equipment is becoming a part of the circular economy – being reused or recycled as much as possible at the end of its first life, so that new products can be made from the same raw materials, with a minimised amount of energy. The latest edition of University Business magazine contains an important article on this theme which we were pleased to support. IT equipment can take significant energy to manufacture, as well as using limited natural materials; so it is vital that we get the most value from those resources. “Waste” should be seen as a point on the lifecycle of those materials, rather than simply an end of life for the equipment. 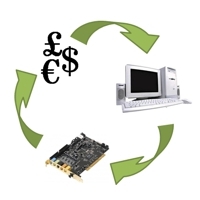 As a result, when considering how we all manage “waste” IT equipment, it’s essential of course to follow WEEE (Waste Electrical and Electronic Equipment) regulations, but we also need to ask ourselves, and our waste management service providers, what more we can do with our waste, so that it is no longer waste but becomes a new supply. Moreover, equipment lifespan can be extended so that it needs to be manufactured less frequently. Also with management techniques such as server virtualisation, it becomes possible to procure less equipment, saving capital cost, embodied energy and materials, and saving money and electricity all at the same time as making IT services more resilient. In this way, effective IT procurement, equipment management and waste management can help you to get the best of all worlds: an integrated environmental management strategy and reduced costs, while supporting leading-edge research and teaching. Makes sense, but how can we extend the lifespan of equipment? Things such as computers and mobile phones have technology that progresses at such an astonishing rate that they have about a 3 year lifespan on average. However if a company decides it doesn’t want to be a part of that tech race then customers will go elsewhere (to companies that do update their tech) – So I think it’s quite a hard thing to change. Fair point Anna. I’m not speaking as an altruist here and I agree companies have to deliver value to their customers. It’s a complex area but there are several ways to get longer life from equipment without negative impact on customer service e.g. – repairing rather than “trashing”/recycling equipment, if it can still do the job effectively. Every situation is different of course and everyone has to use their own judgement about the best use of resources in each case. These actions can actually be beneficial rather than cost-neutral or expensive. E.g. I recently identified and fixed a simple problem with my phone which meant I didn’t need to buy a new one, saving £500, and avoiding all the time and money-consuming problems of changing hardware when I didn’t want to. So reducing waste and procurement can save time and money, which benefits the bottom line. On top of that, many customers and partners are attracted to companies which seek improved environmental management e.g. through ISO 14001 certification. So even where there are marginal costs to better environmental management, there are also major potential benefits.